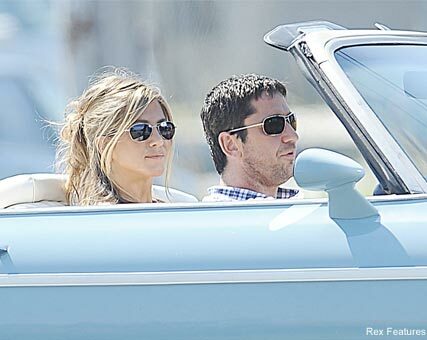 Jennifer Aniston’s off-set love life might be a bit up-and-down, but, on-set, the actress is having a whale of a time! The A-list actress and her gorgeous co-star Gerard Butler took to the road yesterday while filming scenes for their new movie, The Bounty, in Queens, New York. With the sun shining and the top down, it looked like things were hotting up in their baby-blue convertible – and the on-screen couple looked like they didn’t have a care in the world. Rumours about the pair dating in real life have followed them around for months, but both deny any truth in the gossip. Jennifer recently enjoyed a date with her He’s Just Not That Into You co-star, Bradley Cooper – her first since splitting with singer John Mayer a couple of months ago. She must be one lady who can truly say she loves her job!